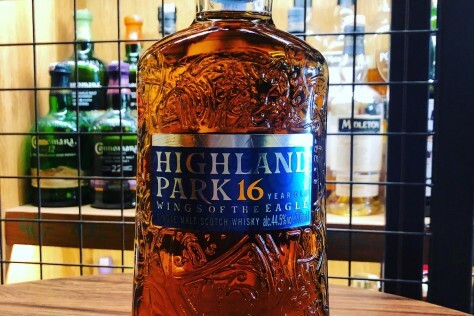 Highland Park 16 years old, Wings Of The Eagle / 44,5% / – In the early 2018 Highland Park phased out the Warrior Collection from the Travel Retail range and replaced it with four expressions created by master blender Gordon Motion. The new range isn’t directly Viking or Norse mythology themed, although it is focused on animals with strong connection to the Norse and Viking mythology. Wings of the Eagle, the 16 years old expression, is a vatting of sherry-seasoned European oak casks and American oak casks bottled at 44.5% abv. The year 2017 was incredible for Highland Park. The brand sales grew up to 1.7 million bottles (the highest ever) showing increase by 24% comparing to the previous year. Nose: mildly smoky with distinctive sherry notes, apricots, prunes, oranges, toffee, marzipan, heather honey and hints of pine needles. Palate: follows the nose, dried apricots and figs, marzipan, honey, vanilla, cocoa powder, nutmeg, dash of cinnamon and pepper and distant whiff of smoke. Finish: fairly long, with notes of dark chocolate, honey, ginger, cloves, touch of tobacco and subtle smokiness.